My Gadget Gangster Parallax Propellor board has just modulated its first APRS packets. This is not down to any clever programming by me. 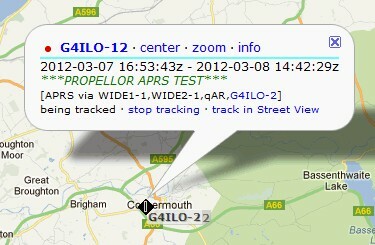 I simply used the Spin APRS Object published by Richard, G3CWI based on code by Alex Erlank. Richard had to make some changes to get Alex's code to work and I had to change a few things as well. Mostly they involved replacing Richard's callsign and position with my own! The AFSK output was connected to the mic input of my old TH-205E using a 0.1uF DC blocking capacitor. There is enough idle time at the start of the packet for VOX to be used if the transceiver supports it. Mine doesn't, so for test purposes I manually keyed the radio's PTT. I found that my packets were not decoded by the Kenwood TM-D710 TNC when I used the option to include a path such as WIDE1-1,WIDE2-1. I'm not up to debugging the code. However, Richard had mentioned that calls less than 6 characters long needed to be padded with spaces so thanks to an inspired guess I found that that this applies to paths like WIDE1 as well. The AX25 object contains a section intriguingly called "demodulator" which has been removed. So it seems that there may be some Spin code that would enable the Propeller to be used as a TNC to decode and display APRS packets. That isn't something I had particularly planned to do, but it would be interesting to see if it works better than the WB8WGA PIC based TNC that I built a year ago which is a bit fussy about the level of the input audio. I should have some improved code soon. I'm no expert but there were several things that needed fixing (like the WIDE1-1 WIDE2-2 code). The system could easily do the demodulation but I was not looking for that functionality.